Morning Wall Stretch. Stand barefoot in front of wall, as shown. Press into wall with both hands and lean forward, feeling stretch along back of left leg and heel. Hold for 30 seconds; switch sides and repeat. Freeze and Roll. Freeze a small water bottle. Cover it with a towel and place arch of your foot on top of it. Slowly roll bottle beneath arch of foot for about 5 minutes at a time. Switch sides and repeat. Rub It Out. 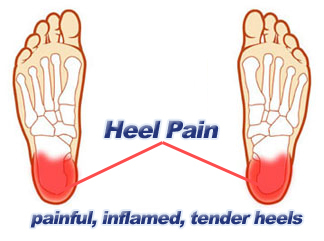 Use both thumbs to apply deep pressure along arch of the feet, heel, and calf muscles, moving slowly and evenly. Continue for 1 minute. Switch sides and repeat. If you foot pain isn’t improving or worsens after 2 weeks, a podiatrist or othopedist can prescribe additional therapies to alleviate discomfort and prevent recurrence.